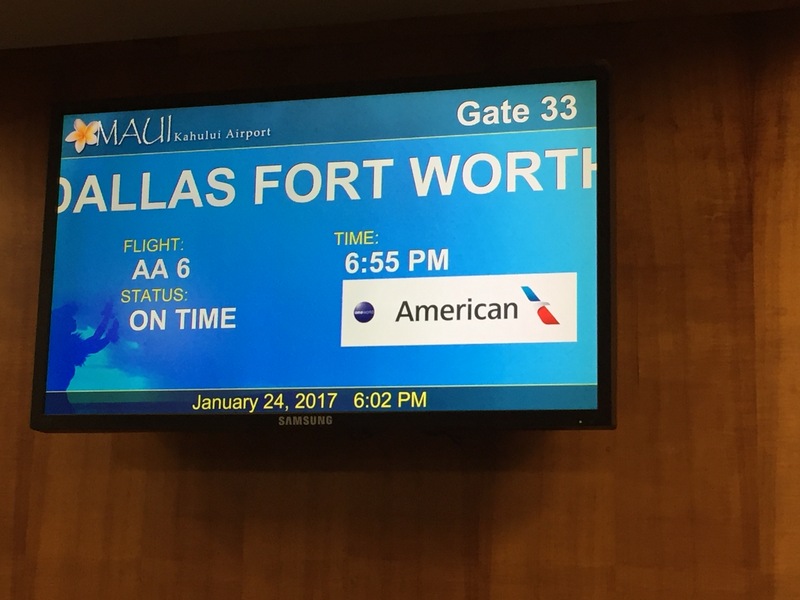 This post covers the flight on American Airlines Maui Dallas Fort Worth. My wife and I arrived at the airport about three hours early. When we arrived, the check in area was completely empty and no other passengers were waiting to check in. 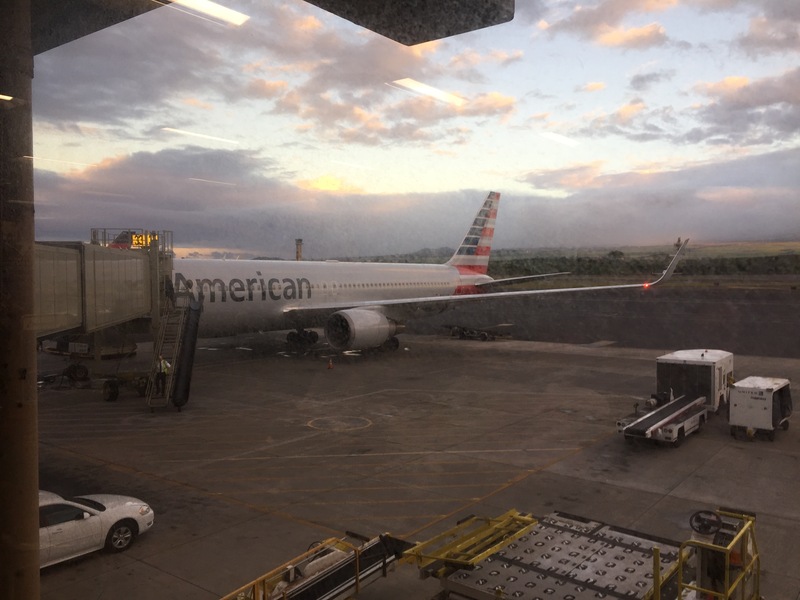 Being that we were in Hawaii, we had to send our checked bags through the Agriculture Screening prior to checking in with American Airlines. Later near the gate area, we had to have our carryon bags checked as well. We entered the ticketing area and an agent asked us to use the kiosk for checking our bag. 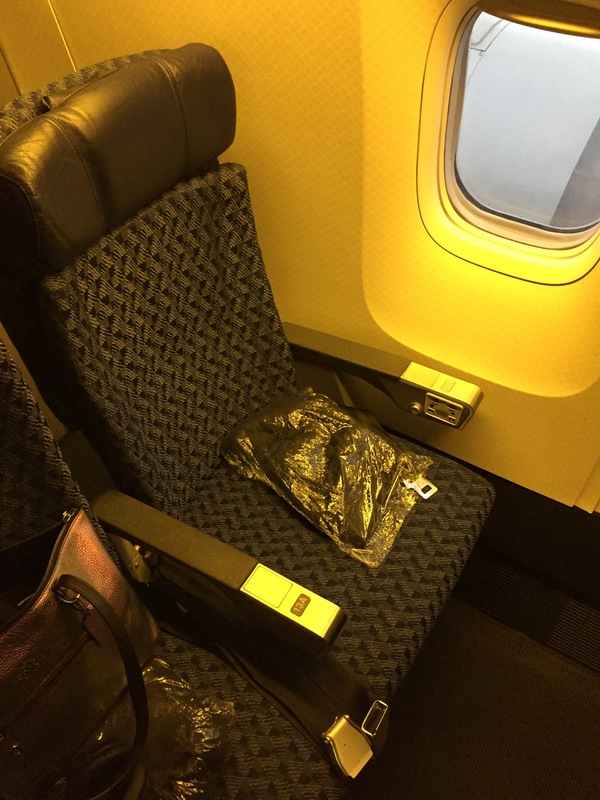 I normally would have followed her advice; however, I wanted to swap my wife and my seat because I noted that I was #1 on the upgrade list and I currently was assigned the aisle, which meant if the upgrade cleared the remaining economy seat would be the window one. A friendly agent assisted us in checking in and making the swap on the seat. She confirmed that I was at the top of the list for an upgrade. We proceeded through security where we also encountered no line so we made it through in a couple minutes. Once in the terminal we had three hours to spare so we visited a bar and relaxed for a bit. The gate area had plenty of seating available so we took a seat and waited for boarding to begin. Boarding starting about 40 minutes before the departure time. We joined the line when Executive Platinum boarding was called. The gate agent was polite and she scanned our boarding passes and invited us onboard. Before boarding, I mentioned I was number one on the list and confirmed I should boards at that time. The agent said yes and I thanked her. From the seat map prior to the flight it appeared that the aircraft was one of the upgraded 767 with lie flat seats because it was 1-2-1 configuration. This unfortunately was not the case. We boarded the aircraft and discovered it was the non-updated 767-300 model with 2-2-2 in business and 2-3-2 in economy. The plane featured angled flat seats in business class and standard economy seats in the main cabin. The aircraft features overhead video, no power outlets and no WiFi. We took our seats in the Main Cabin Extra cabin which is a mini cabin between business and the galley. The seat offered good leg room and decent recline and I found it comfortable for the flight. Shortly before the door was closed, a gate agent approached me and asked if I wanted the upgrade to business class. I said yes, and she asked if I preferred an aisle or window seat. 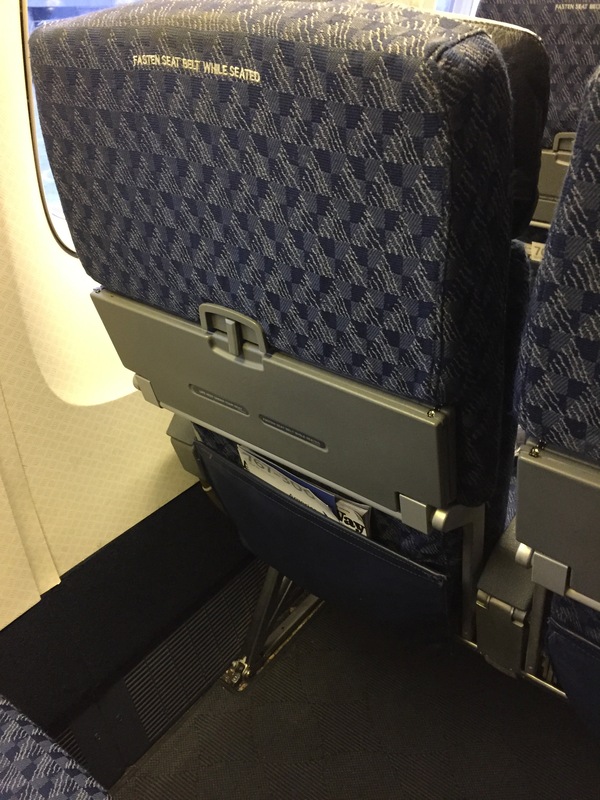 I let my wife choose and she requested the aisle seat. The gate agent thanked us and she invited my wife to the new seat. Boarding was efficient and the flight departed the gate ahead of schedule. There was a short taxi before we were up in the air. 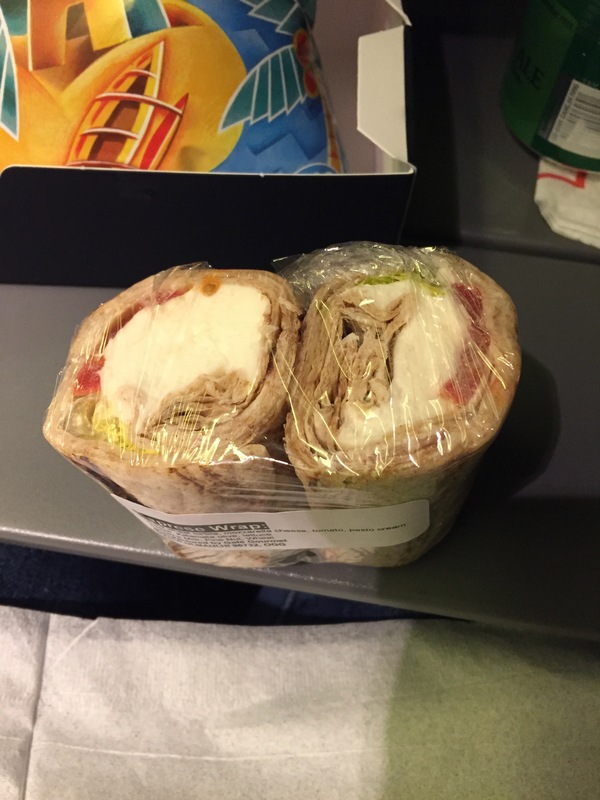 Within 20 minutes of takeoff, the flight attendants offered a meal selection in the economy cabin of a turkey or vegetable wrap sandwich followed by a beverage selection. 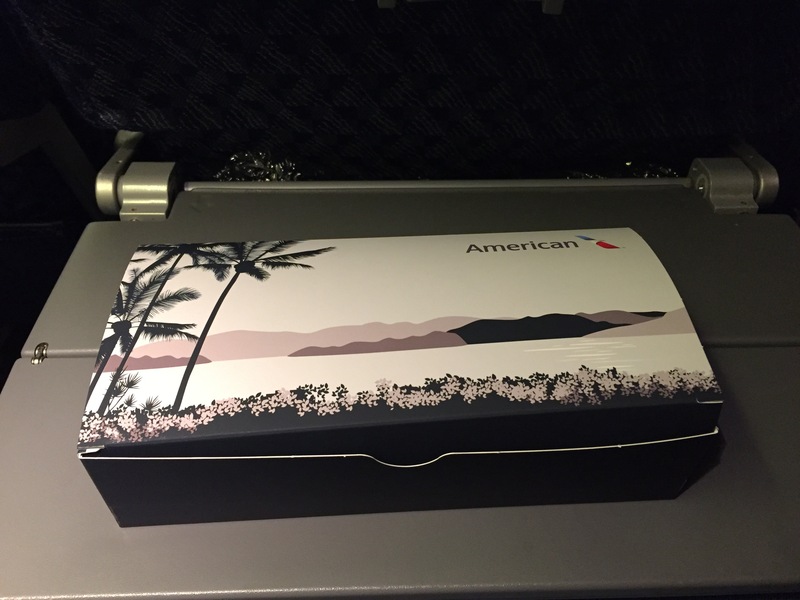 The meal service was similar to the flight from Dallas to Honolulu and the meals were pre-packaged and included a small wrap, chips and a cookie. In this case, the chips were Maui chips and there was a Hawaiian fruit cookie. I selected the veggie wrap and Ginger Ale. The veggie wrap was with tomato and cheese. The wrap was on the small side. The tomatoes were rather soggy and the wrap could have used a bit more flavor. The chips were fresh and crispy and the cookie was fresh and sweet and it had an excellent taste. 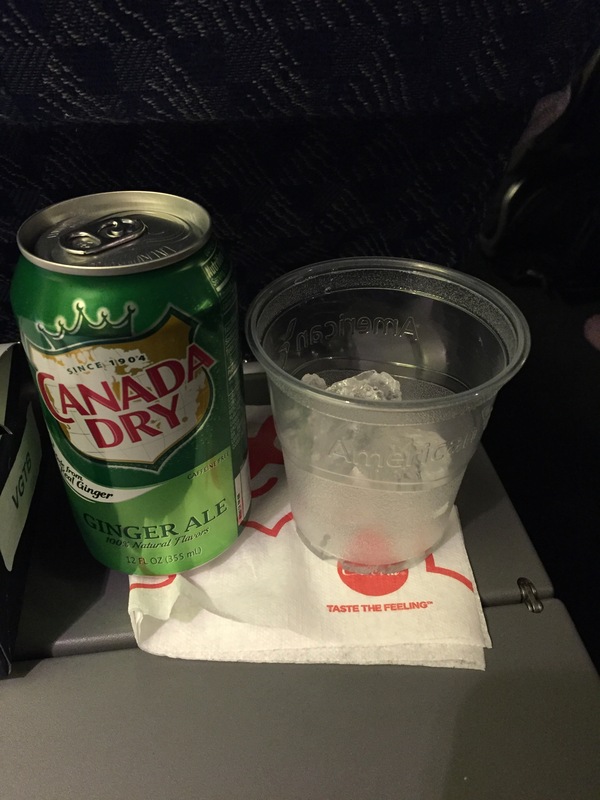 The Ginger Ale was fresh and it had a good taste. 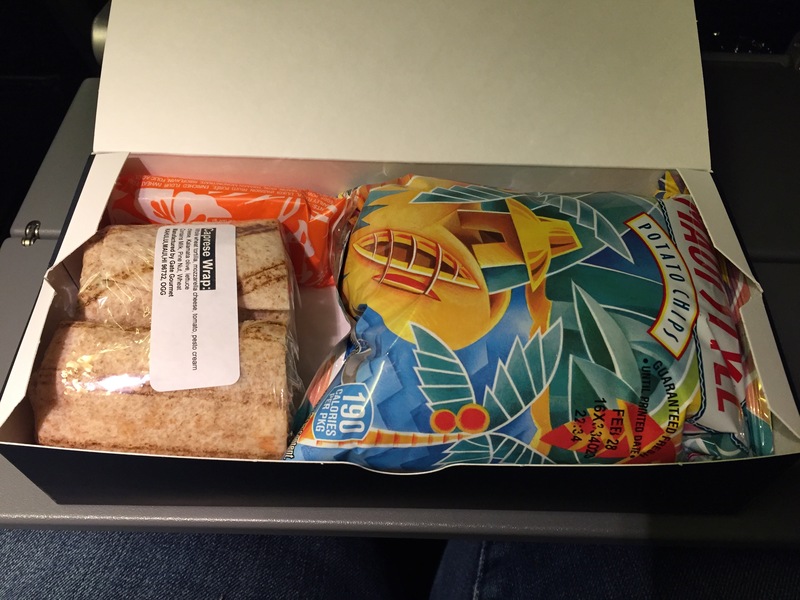 About 30 minutes later, the flight attendants returned to pick up the meal boxes and offer an additional beverage. The cabin lights were dimmed. A movie was shown on the overhead screens. The picture quality was poor. I did not check the sound quality. 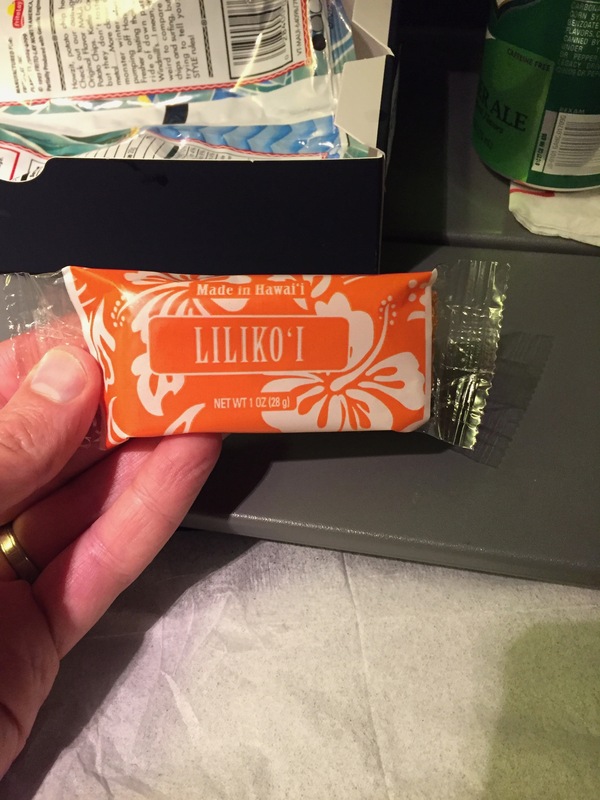 The flight attendants were noted to circulate the cabin every so often during the flight. There was a strong tailwind and the flight only lasted about six hours. We landed 45 minutes early. It was a quick flight and it was rather uneventful. The flight attendants were polite. The meal service was okay. The best part was the Hawaiian cookie. The seat was comfortable and I was able to sleep for part of the flight. Although it was a disappointment the aircraft was one of the older models, the flight went by quickly and soon enough we were back on the ground. Have you flown on American Airlines old 767-300 aircraft? How did your experience compare to mine?